Right, wrong or dead on, male rompers are absolutely a thing. The white hot, pastel-infused onesie has invaded your Instagram…and the summer has only just begun. For this, we can thank Romp Him, a Kickstarter-funded startup that raised over $350,000 in less than 7 days to bring their modern male romper to life. 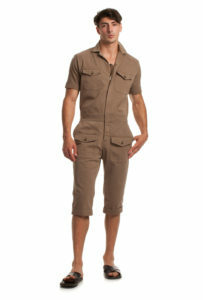 Available in chambray, cotton twill and, if you like to rock a preppy romper, seersucker. The Chicago-based Kellogg School of Management alums, who created Romp Him and operate under group name ACED Design, retooled the femme romper to be streamlined and style-forward. Guy friendly features like a zip fly are much needed upgrades from girl’s rompers, saving men from having to completely disrobe while using the restroom. 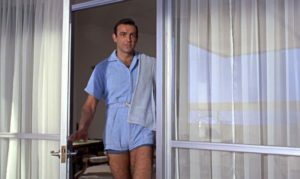 Romp Him isn’t the only brand on board with the male romper trend. You can find everything from novelty club kid rompers to edgy union suit-inspired styles, and everything in between. One of our favorite brands, Mr. Turk, the men’s line from Trina Turk, has crafted the romper with a more sophisticated and luxe silhouette. 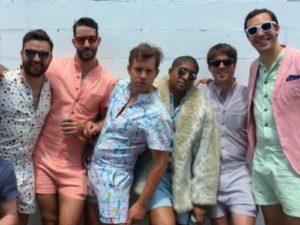 Not for the timid or tone-free, these male romper’s demand a fresh-from-the-gym physique (see below) as well as offer dressed up or down versatility. 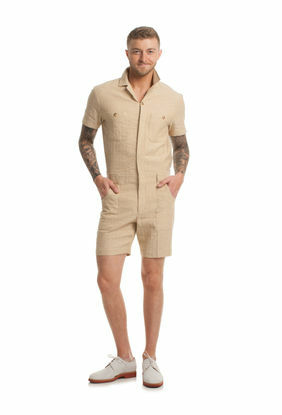 The Mr. Turk fabrics, cut and styling raise the romper far above novelty status to handsome resort wear. 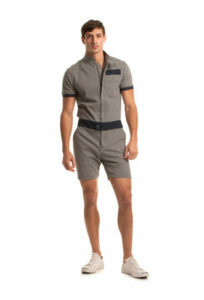 Male rompers aim to fuse comfort and fashion for the forward thinking guy who wants to go out or just get comfy. Get ready to see them (whether you like it or not) invade summer pool parties, backyard bbqs and sundecks from coast to coast while the weather is warm. 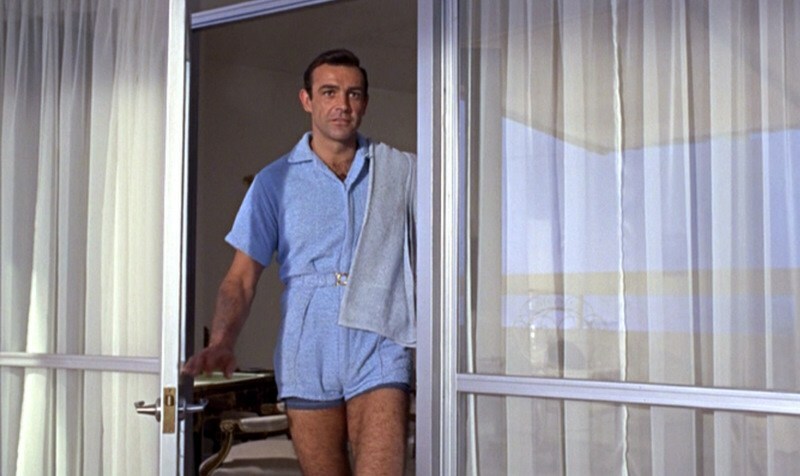 And if you’re reclining on your yacht, consider channeling Sean Connery in Goldfinger, who wore a handsome, belted powder blue romper as James Bond. 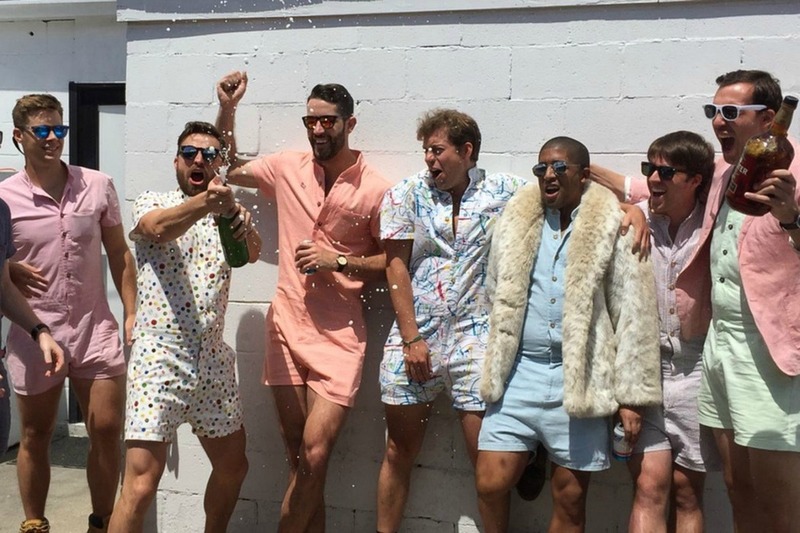 Male rompers: terrycloth, seersucker, zippered or belted, are fast becoming this summer’s staple. I think we should all just be grateful that tube tops are not, currently, an option.